Travellers that venture across the blistering sands of the Altok Desert may stumble upon the Valley of the Ancients; a steep-sided canyon riddled with ancient tombs and ruins. What lies below the ground, deep in the tombs, is best left unknown. 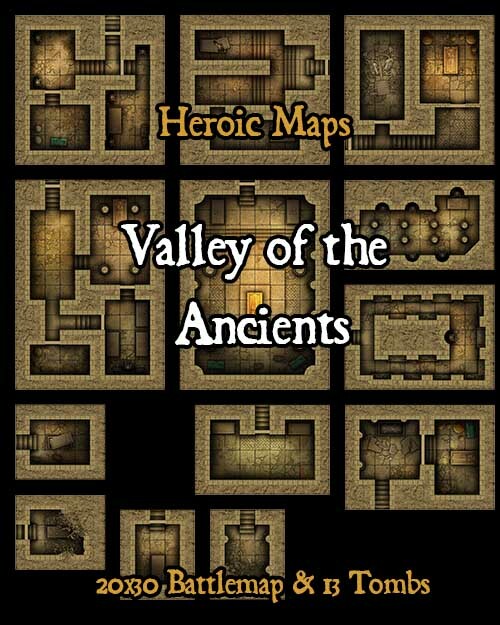 Valley of the Ancients is a printable dungeon floorplan compatible with any RPG/Dungeon-Crawl game. Use as a standalone gameboard, or combine with any same-scale tileset. Contents: A 20x30 battlemap depicting the surface. A dry desert valley, with steep cliffs and ancient Egyptian ruins. Entrances to various tombs lead down from the cliffs. The set also includes 13 tomb battlemaps (of various sizes) which can be used as the rooms below any of the tomb entrances on the surface. The Discover Range features large surface battlemaps and smaller underground rooms and chambers. When your party discover an entrance to the underground, simply use the underground map of your choice. It can be different every time. 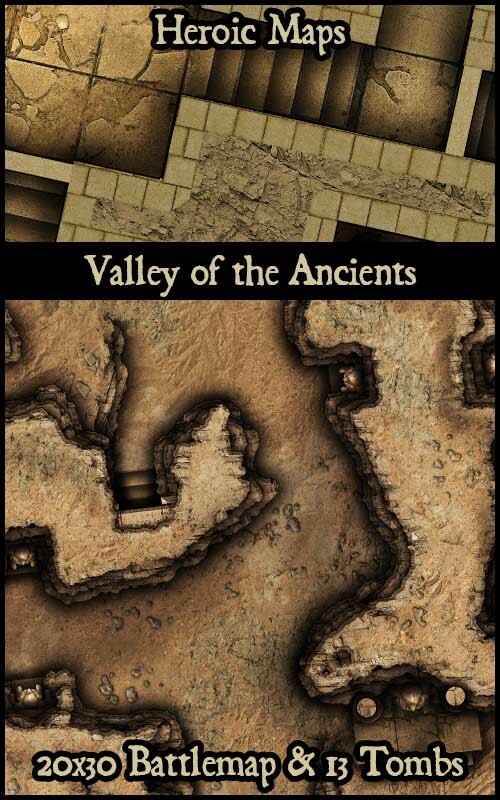 Valley of the Ancients forms a 20 x 30 area, with 13 tomb battlemaps, and can be printed at 28mm and 25mm scale. Have you tried these battlemaps? I purchased this and want to poster print the large surface map with grid at my local print shop. What size does it need to be printed at to get 1" squares? Does this also come with full-size jpgs? This doesn't specify like some of your other products, so I just want to validate before purchasing. Thanks. Yes, it does - sorry for any confusion! Excellent--thank you for the quick response! 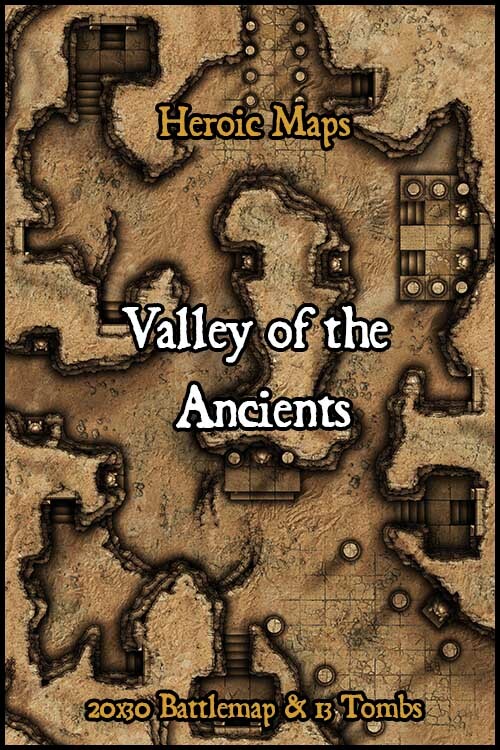 Just purchased your Valley of the Ancients map, excited to use it, but I'm having trouble downloading. When I try to download the PDF, I get this error: "There was an error opening this document. The file is damaged and could not be repaired." When I try to download the images, I get this error: "unable to expand “HeroicMaps_Valley_of_the_Ancients_Surface_jpeg.zip” into “Downloads”." I'll try reaching out to OneBookshelf for help, but as of now the files are totally inaccessible for me. If you haven't already, try downloading it again. The files are fine - it's been downloaded by hundreds of people without any issues. Email us (heroicmaps@Gmail.com) if you still have issues after Onebookshelf have got back to you.